Mobile Police Chief James Barber spoke to residents in the Campground neighborhood saying Friday’s multiple drug raids would keep drug trafficking and its related violence out of the area. However, some seem to think the police work won’t make a long term difference. Within a few miles, multiple law enforcement agencies led by the Mobile Police Department executed search and distribution warrants on eight properties, all of which were related to the possession and sale of illegal narcotics. Those involved included personnel from the U.S. 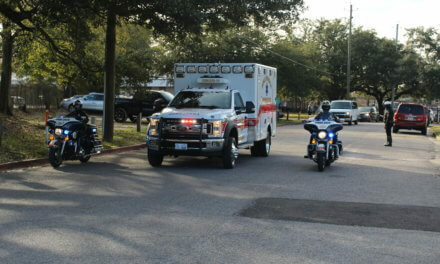 Marshals, the Secret Service and the Mobile County Street Enforcement Narcotics Team. At the time, no arrests had been officially made, but members of the media, who were invited to one scene, observed eight to 10 individuals being detained by authorities at 1076 State St. Barber said police on the scene recovered crack cocaine, marijuana and an undisclosed amount of cash on the premises. Barber said officer have responded to incidents at the home in the past and the city would be seizing the property to “put a stop to the drug activity” for good. He also said the homeowner would be taken to court over the property’s seizure. According to tax records, the home at 1076 State St. is owned by Marie M. Gardner and has delinquent taxes dating back to 2010. The city of Mobile currently has the property up for tax sale, and tomorrow, Feb. 28, will mark another year of unpaid taxes on the residence. It is not known whether the timing of the raid is related to the delinquent tax anniversary. The neighboring property at 1078 State St., on the corner of Kennedy Street, appeared to be a burned pile of a remaining house with an intact shed in the backyard. That property, belonging to James and Marie Washam according city records, has also been delinquent on taxes since 2012. 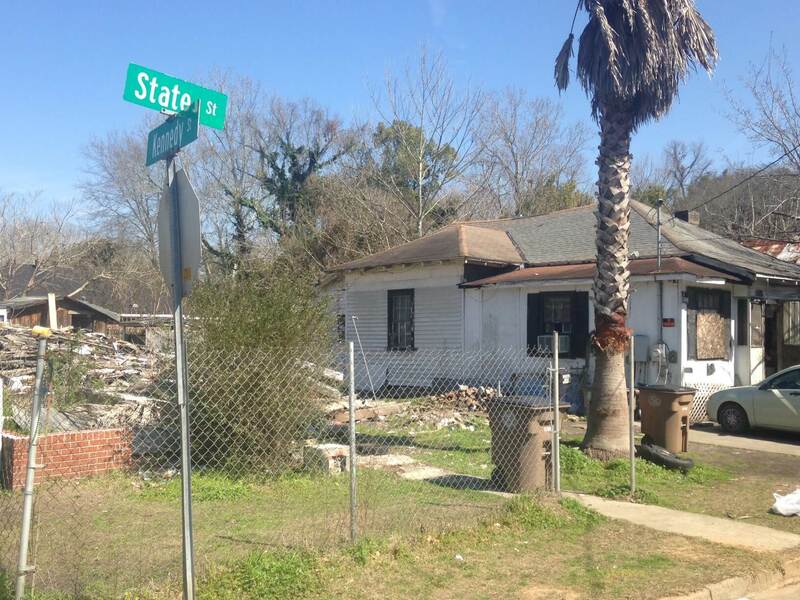 Later on Friday, Mayor Sandy Stimpson’s office declared the property a nuisance and authorized its immediate demolition and clearance. Mobile Mayor Sandy Stimpson speaks on drug activity in the Campground neighborhood. 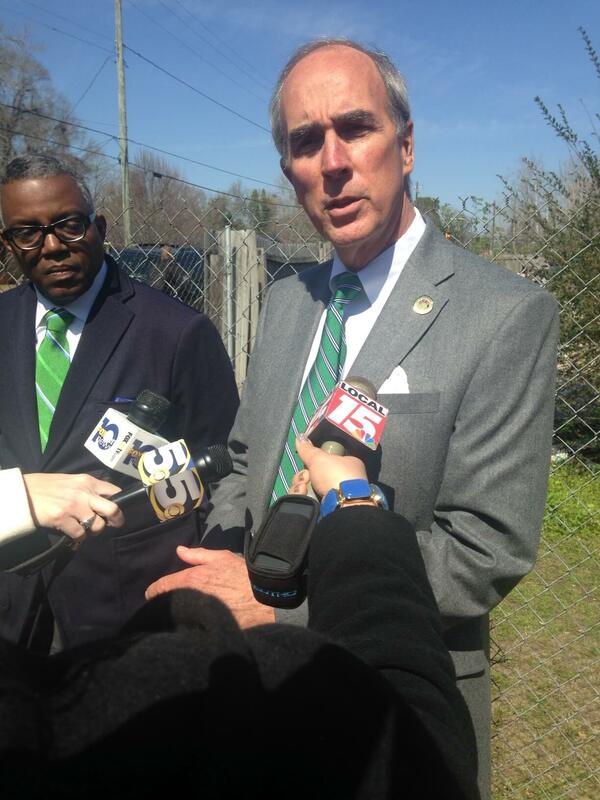 Mayor Sandy Stimpson and Barber visited the Campground neighborhood in late 2014, the first stop the pair made in an ongoing attempt to get Mobile residents involved and working with the city to make their communities safer. He and his fellow neighbors went on to tell reporters that as recently as Saturday, several gunshots were fired outside the home with no response from police. However, none of the residents said they themselves alerted authorities to the shooting, which Barber said can be a problem in neighborhoods known for illegal activity. Barber called drug activity and related violence a “cancer” in the community and said the city would be using combination of criminal and civil legal actions to address the problem. Such actions include seizing problem residences, which the department has done previously. 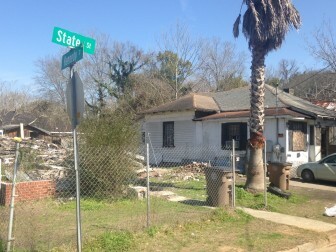 Shortly after today’s raids, Stimpson announced plans to sign an emergency order of demolition and debris removal on the two lots police searched on State Street. 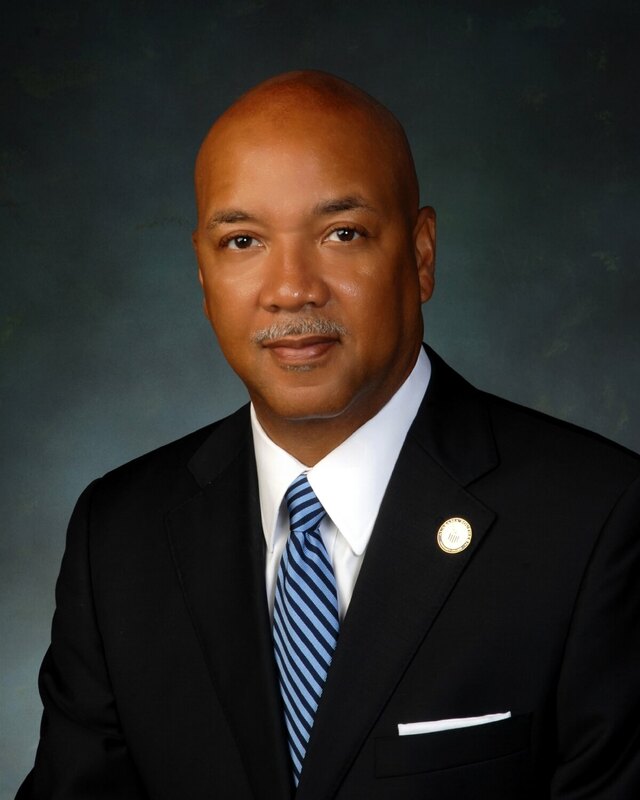 Nigel Roberts, Mobile’s director of community development, said fixing the problems in these troubled communities isn’t just about police action. It’s also about enhancing the neighborhoods. Updated to include information about a neighboring property and its demolition order.